As Mayor, I am proud to present the budget for the City of Meadows Place for Fiscal Year (FY) 2018-2019. This budget is the result of input from Citizens, Council, Department Heads and Staff. It represents long hours of hard work and the dedication of many. Late Spring signals the time to begin the annual budget process. This is done to determine and prioritize the needs of the City. Budget requests are based on the obligations, programs and priorities that the City Council has discussed or committed to in the past. A recommended budget is formed based on the projected revenue and is then submitted to the citizens and the City Council. Council works with both the Mayor and Department heads in a collaborative effort to determine the most effective use or our tax dollars. After input from the public, the Council has the opportunity to revise the budget to conform with its objectives. More than ever, the budget is a planning tool, providing guidance and direction to city staff throughout the budget year. 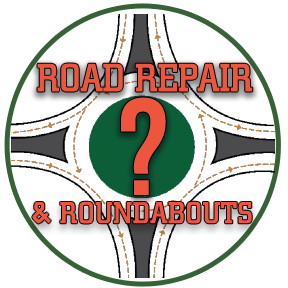 It addresses the goals and objectives set by City Council, meets the criteria of the Meadows Place Vision Statement, and maintains the safety standards set forth by our citizens. The City of Meadows Place is proposing a budget that was developed using a conservative approach as has been our practice in years past yet is able to assure city services and continued progress. To assist in comparative analysis, we have this year’s and last year’s budgets side by side. This budget was developed with a goal of greater accountability and responsibility on the part of all departments – and we believe we met that that goal. Each Department Head worked diligently to prepare this budget. There were multiple departmental budget meetings, first with the Mayor and then with Mayor and Council collectively. Each and every budget line item was examined, scrutinized and justified to see how we could make the budget requests meet the city’s vision and still fit within the projected revenue forecasts. The proposed budget is posted on city’s web site for the public to review and is also available for viewing in the City Secretary’s office. This budget is based on a tax rate of $0.832 per $100 of assessed value. 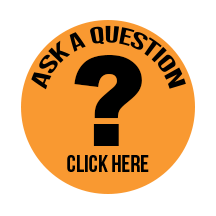 Note: there are no additional MUD, HOA or Levy District taxes in the City of Meadows Place. Thank You, and please feel free to contact me if you have any questions regarding the budget, tax rate or finances of the city. To view the 2018-2019 Budget for the City of Meadows Place, you will need Adobe Acrobat Reader. 2018-2019 Adopted City Budget. 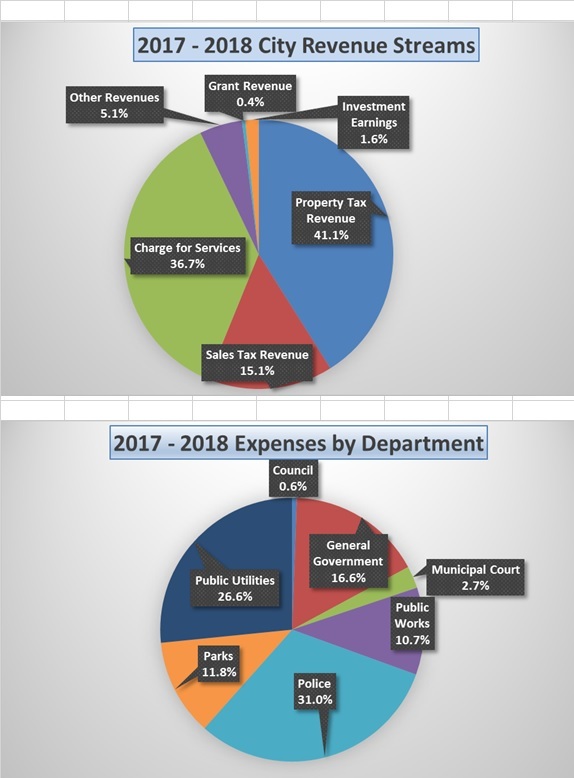 View 2018-2019 City Budget Charts. 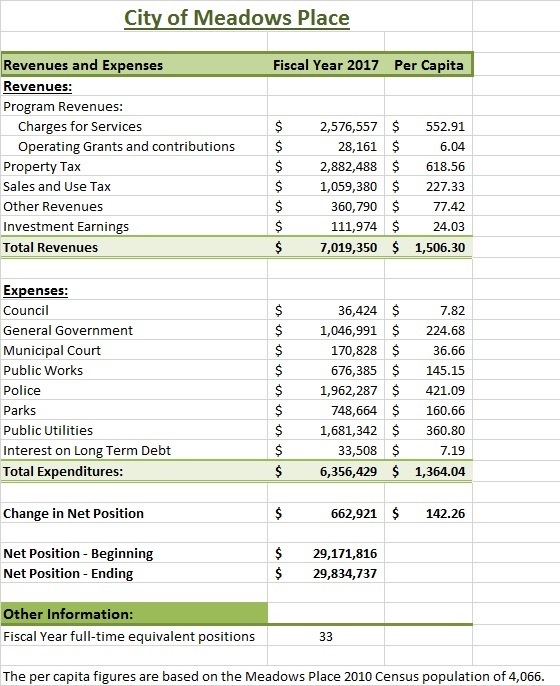 The following summary data is from the City’s 2017-2018 Financial Report . Previous City Budgets for Meadows Place. 2017-2018 Adopted City Budget. View 2017-2018 City Budget Charts. 2016-2017 Adopted City Budget. View 2016-2017 City Budget Charts. Previous EDC Budgets for Meadows Place.